Some years before fondness for ordinary sweet buns were maximal that even petty tea shops will always have a regular stock of it.I have always had a special liking for these spongy soft buns.After a satisfying nap my mind always longs for a hot cup of tea with these special tea buns.Dipping each bite of bun into a hot cup of tea then slowly gulping even the last bit is such a pleasure to enjoy.My fil(father in law)still is a big fan of these eggless sweet bun recipe and most of his night cravings for food is satisfied by these buns.Dealing with yeast as a beginner may be tough for most of us.The real hold comes to our hands when we become used(learn) to correct temperature risings of yeast.If we become well-trained with this yeast proofing temperature issues then baking becomes uncomplicated.Adding milk powder really enhances the taste so don’t ever miss to add.Again baking temperature differs from oven to oven so adjust accordingly. 1.First activate yeast by taking half of the milk water mixture(warm) to it add yeast and sugar. 2.Stir in well till it dissolves,cover and keep in a warm place. 3.It may take 10 minutes to rise. 4.In-between set the other ingredients ready. 5.In a bowl add maida,milk-powder,salt and sugar. 7.When yeast is well risen add this to the maida mix. 8.Stir in with a spoon. 9.Then add in the remaining milk water mixture as needed. 10.Now use your hands to mix,it will form a very sticky dough. 11.Dust some maida to work area and keep on stretching the dough for minimum 10 minutes. 12.Finally smooth dough will form though sticky(moisture will be absorbed to a certain extend). 13.Grease a bowl with butter put this dough and close with a damp cloth. 14.Leave it for 1-11/2 hours or till it rises. 15.When it is rised take out in a work surface and punch the air out(again dust some flour if you want). 16.Add butter to this dough. 17.Stretch and pull for 5 minutes. 18.It will become a smooth dough(cut into equal parts). 19.In-between line the suitable baking tray with aluminum foil or parchment. 20.Make smooth balls and arrange with large gaps.Close with a damp cloth and leave it for the second rise(1/2 hour or more). 21.After rising brush it with butter or milk. 22.Spread some sesame seeds over the buns. 23.Preheat oven at 185 degrees centigrade for ten minutes. 24.Bake this in the preheated oven for 10-15 minutes or bake depending upon your oven’s nature. 25.For me it took 12 minutes. First activate yeast by taking half of the milk water mixture(warm) to it add yeast and sugar. Stir in well till it dissolves,cover and keep in a warm place. It may take 10 minutes to rise. In-between set the other ingredients ready. In a bowl add maida,milkpowder,salt and sugar. When yeast is well risen add this to the maida mix. Stir in with a spoon. Then add in the remaining milk water mixture as needed. Now use your hands to mix,it will form a very sticky dough. Dust some maida to work area and keep on stretching the dough for minimum 10 minutes. Finally smooth dough will form though sticky(moisture will be absorbed to a certain extend). Grease a bowl with butter put this dough and close with a damp cloth. Leave it for 1-11/2 hours or till it rises. When it is rised take out in a work surface and punch the air out(again dust some flour if you want). Add butter to this dough. Stretch and pull for 5 minutes. It will become a smooth dough. In-between line the suitable baking tray with aluminum foil or parchment. Make smooth balls and arrange with large gaps. Close with a damp cloth and leave it for the second rise(1/2 hour or more). After rising brush it with butter or milk. 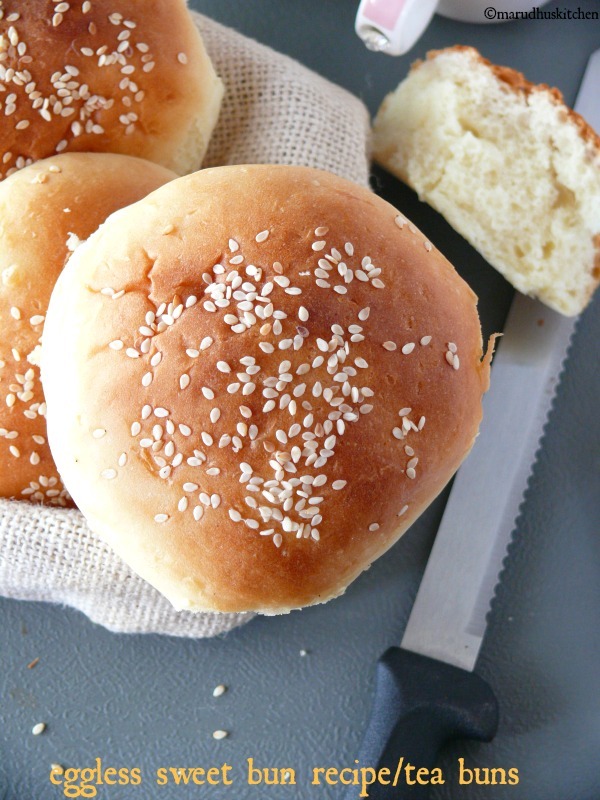 Spread some sesame seeds over the buns. Preheat oven at 185 degrees centigrade for ten minutes. Bake this in the preheated oven for 10-15 minutes or bake depending upon your oven nature. For me it took 12 minutes. Proofing the yeast is the very important level and if the yeast does not proof then you are making a mistake some where. Either yeast may be out of date or you have not used warm water. If the liquid is too hot then yeast will not rise.When you dip in your finger in the liquid finger should be able to sustain the heat. Sugar is added along with yeast as yeast will feed on it and rise. Dough may be sticky but don't care knead well and this will only give a super soft buns. 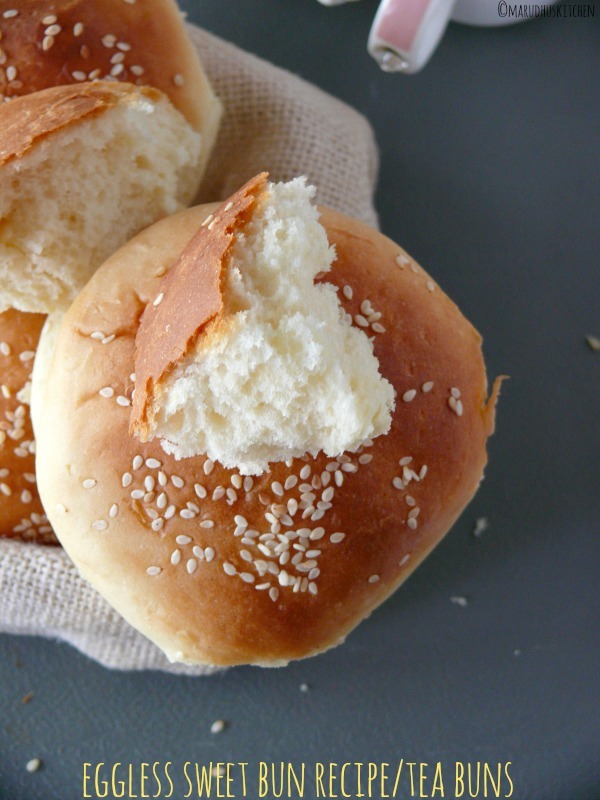 Don't skip milk-powder it gives extra taste to buns. As it is sweet bun I have added sugar to flour itself. Don't use-milk alone use mixture of milk and water in equal quantity. This looks so soft, perfect an delicious! These buns look super soft and yummy, Vani. Love they are eggless. The moment I saw the eggless, I bookmarked it. 😉 Loved the detailed recipe. Great share.